From the opening tip, men’s basketball was outmatched and outplayed by Rhode Island Saturday afternoon. The Rams scored the game’s first 10 points, and by midway through the second half – when GW’s offense found some success – it was just a battle to see how much the Rams would end up winning by. The Colonials (8-8, 1-2 A-10) outscored their opponent by two points in the second half, but never threatened Rhode Island’s lead – falling 81–60 at the Smith Center. The Rams (11-3, 3-0 A-10) are the third team to score 80 or more points against GW’s defense – all three defeating the Colonials by double-digits. Following Wednesday’s loss to Duquesne, the Colonials have not led for two consecutive matchups. 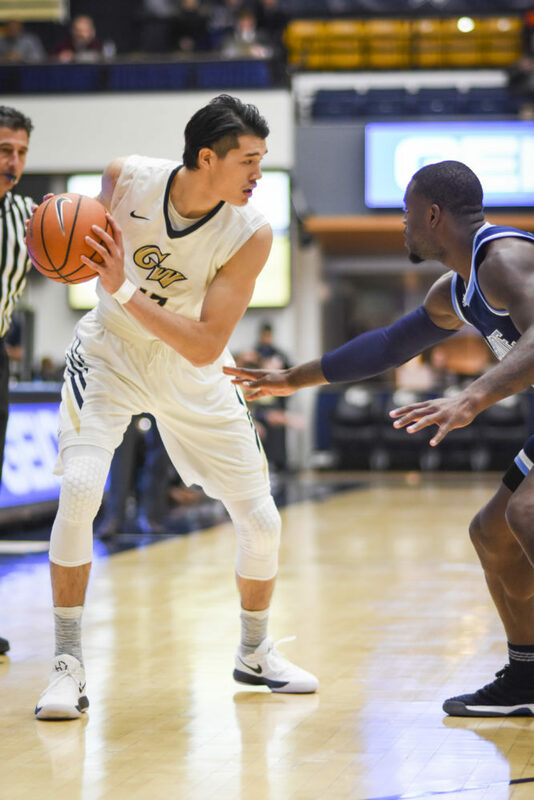 “We have got to just figure out how to come out with energy and just play harder than we did today and the last game,” senior guard Yuta Watanabe said. The Rams offense fed off senior guard Jared Terrell’s offensive prowess, but saw scoring from throughout their lineup. Terrell led the game with 22 points on 9-for-12 shooting, while senior forward Andre Berry and senior guard E.C. Matthews scored 17 and 12 points respectively. As a team, the Rams shot 53.4 percent from the field and 47.1 percent from three-point range. Joseph intended to feature a zone against Rhode Island, but once Terrell and freshman guard Fatts Russell started stretching the Rams lead from behind the arc, the Colonials had to adapt. Rhode Island made seven of its 12 three-point attempts in the first half. Senior guard Yuta Watanabe controls the ball during a men’s basketball game against Rhode Island Saturday. A 17-0 run by Rhode Island 10 minutes into the game set the tone for the rest of the contest and tipped the scale of winning likelihood nearly all the way in the Rams direction. The Colonials trailed by as many as 32 points in the second half as the Rams forwards started to dominate the paint and the Rams guards had little restraint in getting to the rim. The Colonials were led in scoring by Watanabe – who tallied 17 points on 7-of-10 shooting – and freshman guard Terry Nolan Jr. added 13 second-half points after going scoreless in his previous three halves. The Rams started the contest with the control and a large lead. The Colonials allowed 10 points before scoring one of their own and turned the ball over five times in the first five minutes. GW finished the game with 16 turnovers that led to 23 Rhode Island points. Joseph said Saturday’s game was a good opportunity for his young guards to understand what a “championship-level” team looks like defensively. Sophomore forward Arnaldo Toro scored the first Colonials points in the game’s sixth minute and sparked a run that brought the game within two points. Rhode Island slowly increased their advantage to five points over the next three minutes before completely taking over and leading by as many as 25 points in the first half. Sophomore guard Jair Bolden and Watanabe sunk shots from deep and GW made small dents into the Rams’ advantage – but entering the break, Rhode Island led 46–23. After a 10-3 run to start the half, Rhode Island hovered around a 30-point lead for six minutes. Graduate student forward Bo Zeigler and Nolan helped GW have its first offensive run since early in the first half and take the lead under 20 points with eight minutes to play. The scoring slowed down at the end of the contest and the Colonials never brought the deficit under 18 points in the second half. 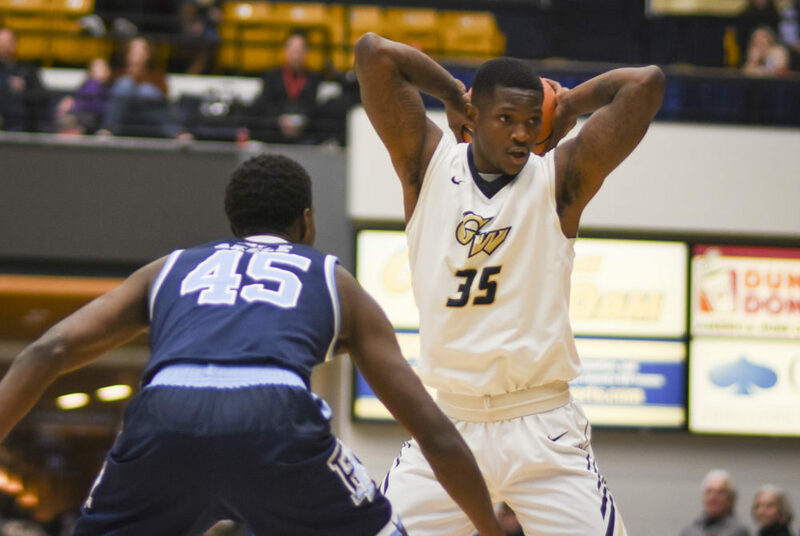 GW returns to action on the road Wednesday against Davidson (6-7, 1-1 A-10). Tip-off is scheduled for 7 p.m.